We make custom Wood and Rope Toys, Rope Swirls and Indestructable PVC and Stainless Steel Toys and Gyms all made in the USA. Our products are enjoyed by birds all over the world. Our PVC Gyms can be found in AL WABRA WILDLIFE PERSERVE in QATAR & BERLIN GERMANY. Our products have also been used in Texas A&M College of Veterinary medicine for the birds at the Schoubot Exotic bird health center. We make all of our toys and gyms ourselves. 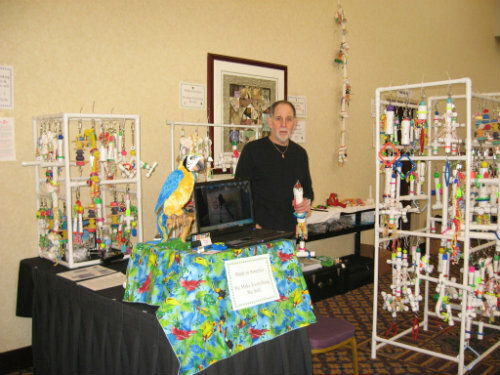 We have been making toys for birds for over Fifty years. We take the same care in the manufacture of safe and durable toys for your birds as we take in making them for our own flock. Our toys are made with 100% cotton rope, from Georgia, pesticide-free wood of different hardness, untanned leather, from Kansas, heavy-duty plastic, from Florida, construction grade PVC, from North Carolina, and Stainless Steel, from Illinois. The perches on our gyms and toys are textured to simulate the feeling and confidence that birds find on natural wood, and birds feel similarly secure. Our superior PVC perches and toys can be sanitized in your dishwasher. We DO NOT use ZINC. Toys are included on all of our gyms. Nothing can be unscrewed or removed from our gyms by your birds. All of the spinners move. Every toy and gym is slightly different because they are custom made. We also will listen to your ideas, if you can conceive it, we can make it!